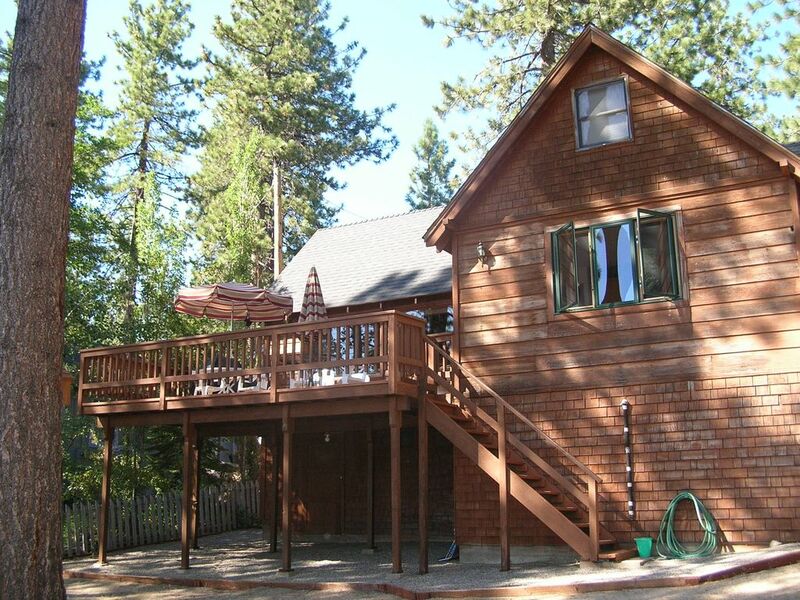 Tahoe Lakefront / Beach Access em Cozy Cabin W / Conveniências modernas. Cabana à beira do lago confortável na tranquila condomínio fechado de Elk Point. Aproveite o acesso imediato a praia semi-privativa. Aproveite o final da tarde e início da noite relaxar no deck com vista para deslumbrante paisagem de montanha, pôr do sol, e no sul e oeste margens do Lago Tahoe. Cabine acomoda 6-8. Quarto principal no andar de baixo tem cama de casal e lavabo. Loft no andar superior é dividido em três seções para a privacidade visual, com uma cama / DBL, um conjunto de duas camas de solteiro e uma dobra para fora futon de casal. Elk Point é uma área única de Lake Tahoe. Desfrute a vida simples de viver em uma pequena e tranquila, a comunidade, ou desfrutar da vida noturna de lojas do centro e casinos, a apenas 10 minutos de distância. Mantimentos e outras amenidades apenas 1 milha de distância. Esta cabine é perfeito para casais aposentados e amigos que procuram fugir, ou para uma família à procura de passar tempo de qualidade juntos. Tendo crescido aqui, e criado um filho de nosso próprio eu sei que este é o local ideal de férias para uma família com crianças pequenas. Comfortable. Well equipped large kitchen. The house is closer to the lake than we thought from the pictures. Walking to the beach area was convenient and only a 2 minutes. The beach area has a barbecuing area with umbrellas and tables. The beach is not crowded and had a roped area just for swimmers with a platform you can swim to and jump off. The deck area of the house has plenty of room. We live within an hour had visitors come for the day and there's plenty of parking. The house was clean and the binder on how to do things in house helpful. There's plenty of trails nearby behind NV Beach. The area is clean, quiet a d safe. If you want to park your car for a few days, and walk 50 yards to a peaceful beach, or just chill on the deck for the evening sunset, this is the spot. Comfortable living room, kitchen and bedroom. If you plan on cooking a lot Gas BBQ is nice and Safeway/ stateline restaurants 3 minutes away or a short bike ride/ walk uphill. Host was totally responsive and house was clean. Nice gas fireplace too. We'll be back! As a long time visitor to Elk Point, I had always wanted to stay in the Lincon cabin. The views are outstanding and that was my main motivation. I was pleasantly surprised to find the kitchen and baths remodeled. It made such a big difference. The kitchen was large and well stocked (but I would have liked a regular frying pan besides the cast iron one). Making breakfast and sitting out on that large deck overlooking Lake Tahoe is very special. I have always adored the private beach and noticed this visit they add umbrellas to the bbq deck. Good choice. We were one of 4 people on the entire beach. If you are a family of 2-6, this is a wonderful cabin in one of the best locations in Elk Point. Our family of 6 stayed here over Labor Day Weekend and had an amazing time. The kitchen/living area was plenty large enough to accommodate everyone comfortably; especially with the huge dining table in the kitchen. The wood deck off the kitchen offered a great view of the lake and another dining option. The beach was literally 100 steps away with Round Hill Marina a short walk away. Home is located in a private community which offers a quiet, peaceful environment. Would definitely stay again! Great location overlooking a beautiful beach, one mile to Safeway, couple miles to Stateline casinos/ South Tahoe. Perfect for small family, gated/quiet neighborhood.